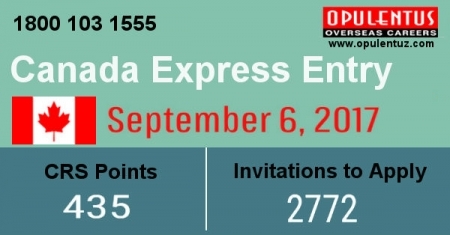 A draw was held on September 6th for the Candidates in the Express Entry Pool for immigration to Canada who had scored 435 or CRS points. They were issued, an Invitation to Apply to proceed towards getting the PR Status. 2,772 candidates were issued, the invite and this brought the total number of Invitations to Apply issued so far in 2017 to 66,549. It is more than those issued in the entire 2016. 60% of all ITAs that were issued since Express Entry was introduced in January 2015 have been issued during the current year. The candidates Invited are given 90 days to submit the application for PR, accompanied with the supporting documentation. The Immigration, Authority has the target to complete the applications process in six months. The present CRS cut-off limit of 435 of the draw is similar to the recent draws, which have a threshold ranging in the mid-430. Prior to the arrival of summer, consequent to the improvements made to the Comprehensive Ranking System in early June, the thresholds stood at 449, 441, and 440, in the three draws held soon after these changes were made. The threshold has not undergone a great change during the three recent draws; the number of ITAs granted has suffered a decreased. When the IRCC commences operations to invite candidates to apply for PR, the threshold is likely to decrease again. The record low threshold of any draw has been413, which happened on May 31st, 2017. This was the last draw held before the changes to the Comprehensive Ranking System were put into effect in June. There are candidates who have completed their bachelor’s degree and based on their advanced English skills, and other credentials, having a score of 436, have obtained an ITA in the present draw. Working in Canada, who have completed a bachelor’s degree in Canada, and have a post-graduate work permit. With their score of 436 and demonstration of adequate intermediate proficiency in English, they have the credentials to succeed in the ranking. The way to enter the Express Entry pool is first to be eligible under a federal economic immigration program of Canada, like the Federal Skilled Worker Class, the Federal Skilled Trades Class or the Canadian Experience Class. It is advisable to go for a thorough assessment of eligibility and explore the options for further improvement subsequently as per the statement, given by Attorney Cohen. After this one can prepare documentation and be ready to be invited. Canadian Permanent Residency is thus made easy when following tips from experts.